She also did the illustrations, saying to me: "The rabbit is a 'reading rabbit.' Get over it." SIR, YES SIR! Kid: "I'm back. I'm going to do my job now." Me (handing her the clipboard): "Okay. You're better at it than I am!" Kid: "What do you expect? I'm a cute little girl, they love me." Me (jokingly): "What are you trying to say, I'm not a cute little girl anymore?" Me: "No, I'm saying you're not a LITTLE girl." The truth hurts, my friends. Anyway, even though we all love our jobs, summer is definitely a tough time for public children's librarians, especially if your library is short-staffed and under-resourced. I have no words of wisdom other than to say: like all the summers before, we WILL get through this one (although, unlike my little helper friend, I cannot necessarily promise that it will be fun. That's what bourbon is for). Personally, I am going to try my best to have a positive attitude this summer (at least while AT the library), and think about the fact that summer reading actually is good for kids and we ARE making a difference, even in smalls ways, and even if we don't always know it. Thanks for this funny post. I am in my last semester of Grad school @ University of Buffalo and in the fall I will student teacher for my MLS degree and ny state certification K-12 school library media (*sigh). 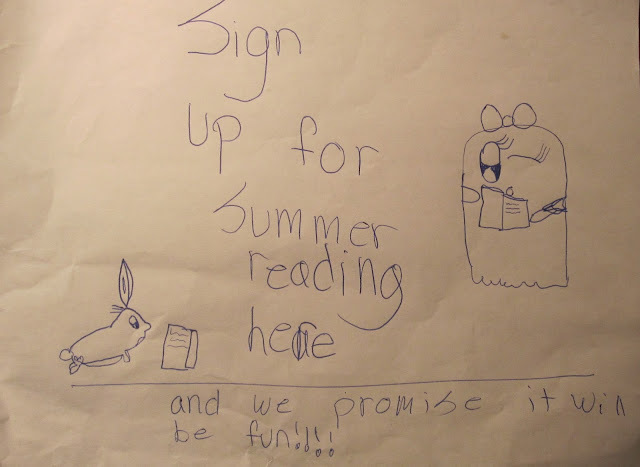 I am currently writing a summer reading program for a local public library (any library, any town usa!). I was wondering what kinds of incentives you use to get children to reading during the summer - other than get a free at the end! Our teen librarian and myself repeat this mantra when we're stressed: "All that matters is that children are reading!" It has been a super crazy start to summer! Two of our new programs (story and sing along for ages 1-5 and tween/teen crafts ages 10+) each doubled in attendance in a week! I told my fellow coworker, "You're gonna need a bigger boat." har..har.. I keep telling myself that in 30 days, I will no longer be doing anything related to summer reading, EVER AGAIN. Our big programs start next week, and it will be cray-cray in here until August. 200-300 kids every Tuesday and Thursday for our performers. 75-150 M/W/F for story times. 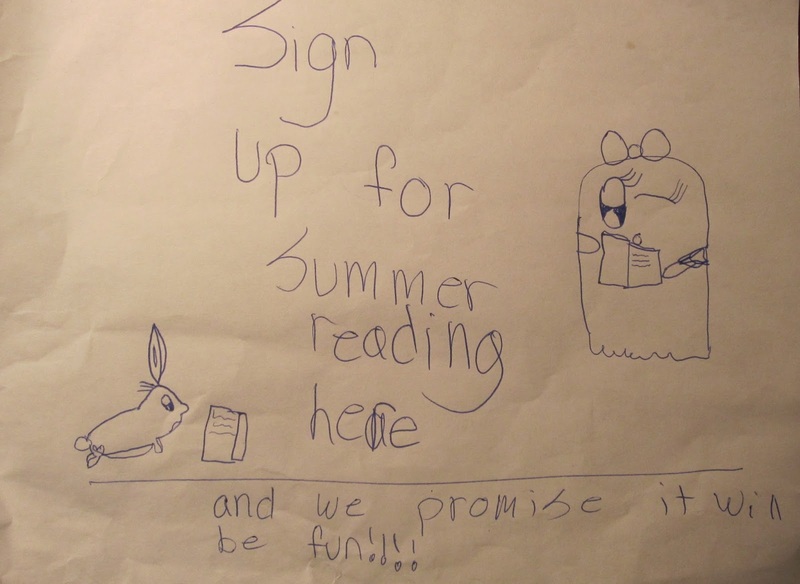 Ah, summer reading programs! Your little assistant sounds awesome, if maybe a little overzealous.